For everyone who has already forgotten Ping was Apple's attempt at social networking around music. It was poorly implemented, closed (could not access outside of iTunes) and pretty much useless. Conceptually it wasn't a bad idea. Create a social experience around music. Fans who love artist and their music could connect with the artist directly through iTunes while also 'like' and comment on the artists music. You could what they were hoping for in their marketing imagery. I believe they hoped that this would lead to more sales of iTunes content primarily however I also believe they had another agenda. iTunes is really poor at suggesting content to me. I mean really poor. In fact I cannot believe It's just me. I struggle to believe the iTunes Store front page is good at suggesting content to anyone. It's 100% curated content and takes none of your preferences / behaviours into consideration. Even if you overlook the awful layout it really is a poor start page for the biggest music store in the world. There is nothing in the image about I am interested in. I'm part of the dying breed of people who buy music and a large portion of my monthly purchases are from iTunes. Therefore for me Apple has the opportunity to offer suggestions more in line with what I like. Oddly Apple have never done this on the front page but do on search results pages and this used to contain Ping influenced results. 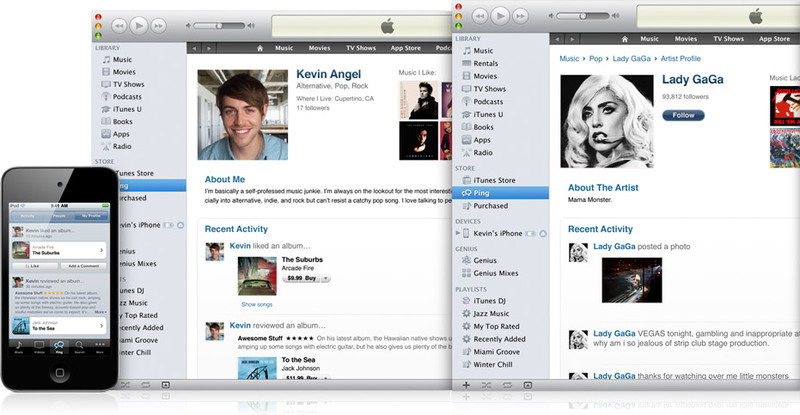 iTunes Store front page strangely highlight the odd decision they made with the placement of Ping. Apple tends to chosen uniformity over customisation. Posted in Apple and tagged with Apple, Social.